To appreciate The Mother of Us All, an experimental opera with libretto by Gertrude Stein and music by Virgil Thomson, it helps to climb out of the box of 19th century opera and literature and open the tool case of Einsteinian physics, William James psychology and philosophy, and Picasso Cubism. In simpler terms, this means the viewer needs to be aware of Stein’s use of fractured time lines (Einstein), her intense look at how people behave and what their value systems are (James), and her employment of multiple points of view (Picasso). Additionally, the operagoer must be prepared for a landscape of American music that is not tied to European operatic models. The subject of the opera is Susan B. Anthony’s life-long struggle to gain voting privileges and civil rights for women in the United States. This work is the second opera collaboration of Stein and Thomson. Mother premiered May 7, 1947, at Columbia University, commissioned by the Alice M. Ditson Fund of the university. When Thomson approached Stein about the commission, he suggested a look at political life in 19th century America. Enthusiastically receptive, Stein chose Anthony as the centerpiece of the work. Anthony (1820-1906) died before the 19th Amendment to the U.S. Constitution became law on August 26, 1920. Anthony’s struggle to gain legal respect for women in the United States by obtaining full civil rights parallels Stein’s struggle for recognition as a serious artist. Virgil Thomson’s radical departure from 19th century European operas that created roles for divas is to this day shrugged off by the casual listener as too simplistic. In creating the first thoroughly American opera Four Saints In Three Acts, Thomson infused his musical landscape with hymns reminiscent of his Southern Baptist upbringing in Missouri. The Mother of Us All features the sounds of American marches, hymns, spirituals and folk melodies. Except for a short reference to a well-known children’s song “London Bridge Is Falling Down,” all the music in Mother is original. Subtle bi-tonalities appear throughout the work, but the work is predominantly lyrical and set in major keys. Emphasis is on the words, and there is little, if any, ornamentation in either the vocal or orchestral scores. This is not a diva’s opera with pyrotechnic arias. There are 27 players in the opera, and it’s impossible in a first viewing to know who each one is. The players have relational groupings and some of these characters, anachronistically included by Stein, are people with whom she was friends. Susan B. Anthony and Anne form the primary pair. Anne represents Anna Howard Shaw, one of Anthony’s disciples and the friend who cared for Anthony at the end of her life. Although the San Francisco Opera production seems to suggest a gay relationship, there is no historical evidence to substantiate this. Some of the disputatious or political groupings include Anthony and Daniel Webster; Andrew Johnson and abolitionist Thaddeus Stevens; Webster, Johnson, and Stevens as the VIP chorus in the dream scene of Act I, Scene 4; and Indiana Elliot’s brother who opposes the marriage of his sister to Jo the Loiterer. Several absurd romantic pairs provide levity against the political character groups. These include Daniel Webster and the supernatural Angel More, President John Adams and Constance Fletcher (an American playwright who was a friend of Stein’s), and Jo the Loiterer (modeled after the American writer Joseph Barry) and Indiana Elliot. 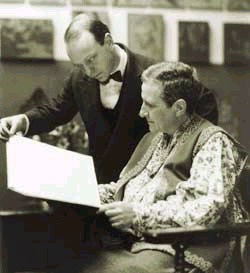 Stein and Thomson are also characters serving as narrators. Stein invented Virgil T but Thomson divided up the text for Virgil T and added Gertrude S. In the ground-breaking first opera Four Saints in Three Acts, Thomson also created two narrators named the Commere and Compere which he modeled after similar characters encountered in French variety shows. This allowed Thomson to include Stein’s stage directions. The opera begins in Susan B. Anthony’s parlor and sets up the theme of women’s suffrage and Anthony’s struggle. There is a public debate between Anthony and Webster. Webster refers to Anthony as he, underscoring that women were not recognized in public forums. Stein also introduces the theme of the overly serious patriarch and emphasizes the name Daniel which was both her father’s and Anthony’s father’s name. Andrew Johnson and Thaddeus Stevens argue and refer jarringly to Gallup the poll. (Donald Gallup, the Yale University Librarian who archived Stein’s work, also appears in this scene and cannot help Anthony.) Ulysses S. Grant makes reference to Eisenhower. These anachronistic reaches into the Twentieth Century were Stein’s way of stirring her audience from complacency by changing the reality. Also note that Stein actually uses quotes from many of the historical figures on which her characters are based, including Anthony and Webster. Anthony deliberates about how difficult her mission is. Most of this scene is a dream where she seeks help from men who can’t or won’t help her, including a black man whom she helped enfranchise. The VIP chorus of Webster, Johnson, and Stevens ignore Anthony’s plea for help while exclaiming their own importance. One suspects Virgil Thomson is spoofing Gilbert and Sullivan. The scene concludes with a discussion between Anthony, Jo, and Chris the Citizen about the difference between the rich and the poor—the rich don’t listen while the poor do, but are powerless to act. Jo the Loiterer and Indiana Elliot marry over the protests of Indiana Elliot’s brother. Anthony reflects on the institution of marriage and why she has not married. The second act finds Anthony at home doing housework and refusing to speak at a political gathering. The crowd outside her door asks if she is still alive. (Anthony campaigned for suffrage into her 80s.) Anthony answers with a reference that clearly invokes Gertrude Stein’s life, “Painters paint and writers write and soldiers drink and fight and I I [sic] am still alive.” Eventually she relents and joins the crowd to speak. She speaks so persuasively that she scares the men into writing the first occurrence of the word male into the Constitution. In real life, Anthony used the 14th Amendment, which guarantees civil rights to all citizens to convince petty officials in Rochester, NY, that she was eligible to vote and vote she did for Ulysses S. Grant. For this act, she was arrested and because she was a woman she was neither allowed to defend herself nor have a jury of peers. Subsequently the 15th Amendment was ratified. Although it prevents states from prohibiting the right to vote based on race, color, or previous servitude, it restricted illiterate men, non-tax payers, and women from voting. SFO has pulled out all the stops to make this production successful. Susan B. Anthony is sung by Luana DeVol, an American singer whose career has been largely in Europe. On first thought, one would imagine Ms. DeVol as too big a woman to play Anthony, whose photos show a small, frail figure. However, DeVol in a black Victorian dress created an appropriate and impressive Mother of Us All, both in appearance and voice. All the singers offer outstanding credentials, including SFO first-timer Wendy Hill as Constance Fletcher. Ms. Hill, one should note, created the leading role of Alice B. Toklas in Jonathan Sheffer’s Off-Broadway opera Blood on the Dining Room Floor. In 2000, stage director Christopher Alden and set designer Allen Moyer also worked on the New York City Opera production of The Mother of Us All. The same impressive sets from that earlier production here complement Stein’s absurd character combinations—Anthony’s desk is piled sky high with books, Anthony’s parlor wall contains unexpected windows, doors, and a mini-stage, and the podium from which Webster and Anthony speak is gargantuan. The volume of sound produced by the singers was unfortunately insufficient. One yearned to hear the words more loudly and not have to rely on the super texts. Occasionally it was hard to tell which singer was singing. This might reveal a lack of confidence on the singers’ parts because it seems impossible to think the individual singers, especially DeVol who is known for her Wagnerian roles, are not capable of filling the San Francisco Opera House with their well-trained voices. Conductor Donald Runnicles and his 54 musicians produced a balanced level of sound and a beautifully delivered concert.